Driving home from the post office on a different route, I came upon a steeple that I’d never seen before – on the Wedgwood Community Church. 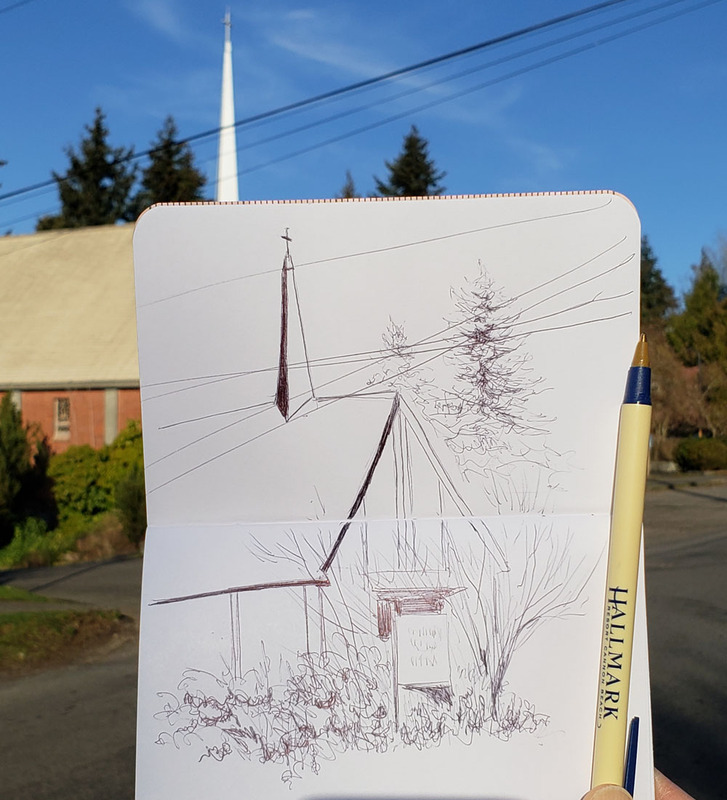 The rest of the church was relatively plain and simple, and I always think the steeple is the most fun part to sketch anyway. I made the first change to my minimal sketch kit: I added ballpoint. I didn’t cheat, though; my rule is that if I add something, I must take something out (so I’m still carrying the same number of implements). I took out the Caran d’Ache blue/red bicolor pencil, which wasn’t earning its keep. I thought that the fact that it’s water-soluble and that it added two more colors to my palette in the space of one would make it a hard worker in my minimal kit. But when I tried to use the “licking” method to paint the sky in a recent sketch, I found that the bicolor pencil doesn’t make a rich enough wash. 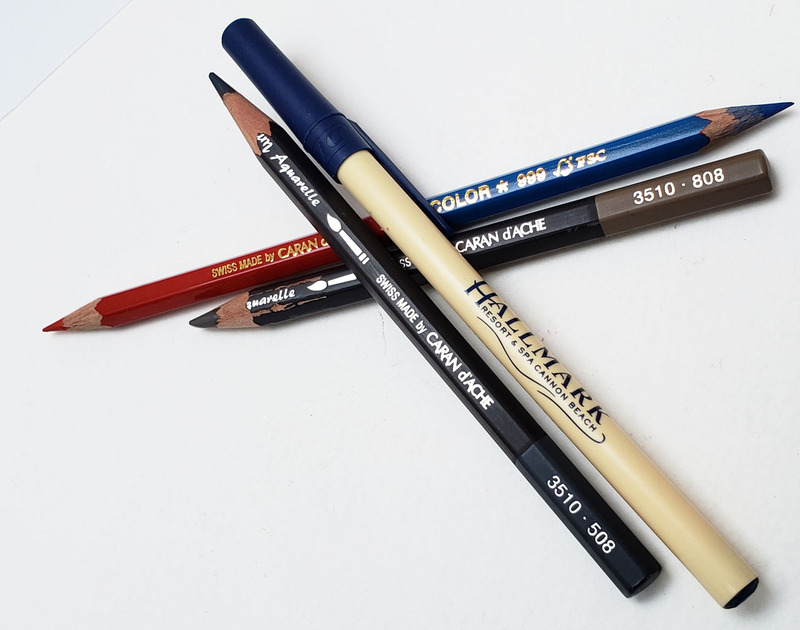 I had heard that its cores are the same as what’s found in Caran d’Ache Supracolor pencils, but I don’t believe it; I think the bicolor contains less pigment. 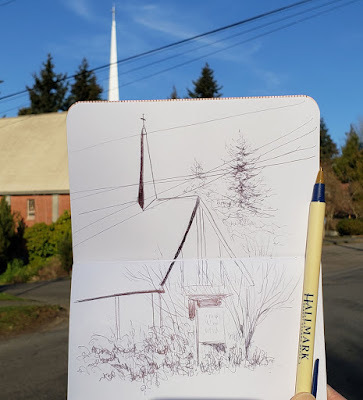 I guess I’ll do without blue for the rest of the month (I’m also not optimistic that I’ll need it much for sky – this sketch was made on the last cloudless day for the foreseeable future). Another minor change I made was to swap out the warm gray (808) for a cooler gray (508). On these short winter days, the long shadows look very blue to me (with my secondary triad palette, I’ve been using purple). I like how you revise your sketch kit so logically. I'll be watching to see how your sketches change going forward.